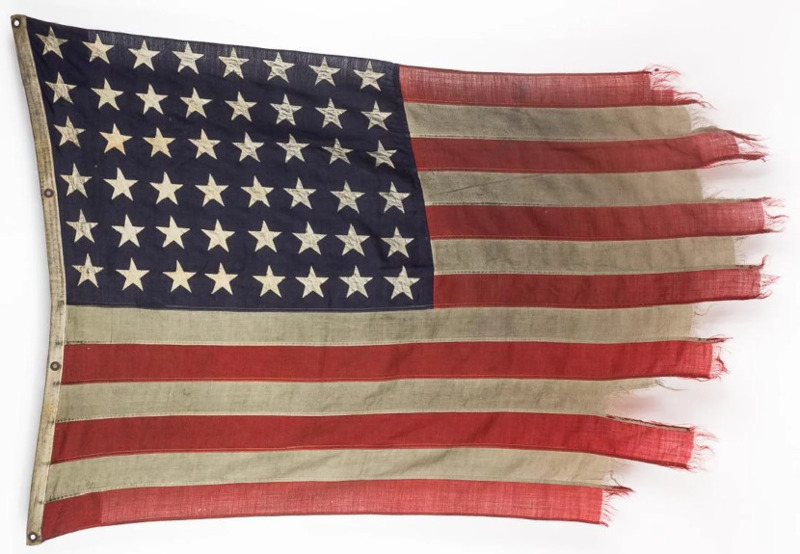 A US flag flown aboard an American landing craft on D-Day (June 6, 1944) is set to appear at Alexander Historical Auctions on April 17 with a $60,000 estimate. The remarkable piece of wartime history is frayed and stained with diesel smoke. It flew above USS LCI(L)-413, which carried soldiers from the 115th Infantry Regiment to their date with destiny. Navy quartermaster Carroll Key Wood brought the flag home. He gave his own account of the attack to the Charleston Gazette-Mail in 2004: “We dropped our anchor and charged ahead at full speed plowing up sand as we went and touched dry land with the nose of the ship. The attack was one of the most successful allied engagements of the war, turning the tide against the Nazis. The lot is accompanied by a letter of provenance from Wood’s sign, who is behind the consignment: "…When my father returned home after the end of the war, he brought home with him a tattered approximately 3’x 5′ American flag which he told all of us had flown from his landing craft on D-Day. “He described his unrest as he walked down the gangway from his ship when he returned from Europe because he had packed the flag in his duffle bag and did not want to face the embarrassment of keeping the flag…"
A number of other D-Day flags have sold over the years, including one flown above LCC 60 –the first boat to land on the Normandy Beaches. It made $514,000 at Heritage Auctions in 2016, a record for a second world war US flag.